Propeddle schematic, just after converting it to Kicad. I’ve been working on my Propeddle project for about three years now (on and off — mostly off), and one of the things that’s been on the to-do list for a while is to move the schematic from the free “Light” hobby version of Eagle to Kicad or some other electronic design program that will let me make the PCB bigger, and won’t take me to court for selling my design as a kit, and won’t cost me so much that I have to double the price for the kit to make up for the expense. I’ve tried the conversion before and it failed every time, and I couldn’t figure out why. I even tried other software besides Kicad (such as DesignSpark, which I really liked by the way) to see how much trouble it would be to just start over. There’s a script online called eagle2kicad.ulp which you can install in Eagle to convert schematics to Kicad format. Apparently it’s not perfect so I’ll have to make sure that everything is correct in the converted file, but all it did for me before, was generate a file that had a lot of text in it that was apparently correct, but showed up as a blank schematic in EESchema. For some reason I decided to try it again today and it still wasn’t working, but I noticed that there was a small blue line next to the border. 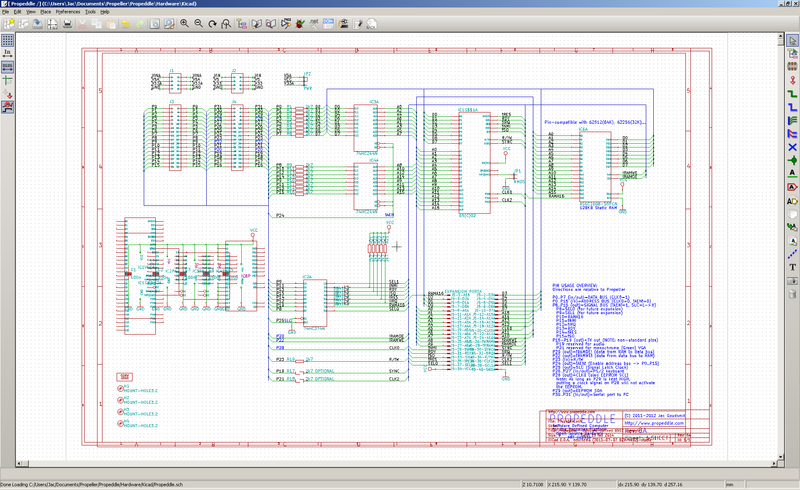 When I zoomed out, I saw a giant version of my schematic. So I did some googling and found out there’s a bug in the .ulp file which makes it get the scaling all wrong, by a factor of 32 to be exact. Strange that CircuitBee (who publishes the version of the script that’s on top of the Google results) hasn’t fixed it. It really is a small bug. Anyway, the schematic is far from perfect and the script doesn’t convert the PCB layout (only the schematic), but that’s not a big deal, I want to make a new PCB anyway: the current schematic is based on the fact that the user has a Propeller Platform motherboard and a modified Propeller Platform audio/video/keyboard shield, and my goal is to produce a PCB that has everything on there, including one or two improvements from what it is now. At least now I have the converted schematic, it will save me a lot of work getting started on that.